We’d love your help. Let us know what’s wrong with this preview of DC Comics One Million Omnibus by Grant Morrison. In the 853rd century--one million months after the publication of ACTION COMICS #1--Earth remains safe, thanks to the heroics of the JLA of the future. 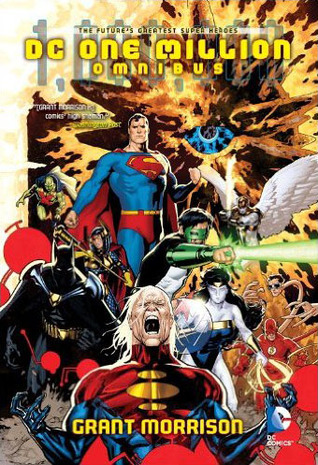 The descendants of Batman, Superman, Wonder Woman, The Flash and others remain united in combating forces of evil, but perhaps have never met anything as deadly as the sentient super-computer Solaris, the Tyrant Sun. As t In the 853rd century--one million months after the publication of ACTION COMICS #1--Earth remains safe, thanks to the heroics of the JLA of the future. The descendants of Batman, Superman, Wonder Woman, The Flash and others remain united in combating forces of evil, but perhaps have never met anything as deadly as the sentient super-computer Solaris, the Tyrant Sun. As this villainous threat becomes too much to handle, these heroes of the future turn to the only group they know can help: the original JLA. Written in the middle of Grant Morrison's smash-hit run on JLA, DC ONE MILLION was the first of the game-changing writer's mind-bending DC crossovers. With art by Val Semeiks and Prentis Rollins, the entire DC ONE MILLION series is reprinted here, along with every crossover issue and tie-in. This massive omnibus edition is a must-have for collectors of Grant Morrison's DC work. To ask other readers questions about DC Comics One Million Omnibus, please sign up. Grant Morrison superhero stories can be weird, thought-provoking, metatextual deconstructions of the genre. Or they can be weird, fast-moving, high-concept adventures. I can appreciate and enjoy the former, but it's the latter that thrills me most. DC Comics One Million is one of the best examples of Morrison in his high-concept adventure mode. It's the story of the Justice League of America (Superman, Batman, Wonder Woman, Green Lantern, Flash and Aquaman) swapping places with their far-future c Grant Morrison superhero stories can be weird, thought-provoking, metatextual deconstructions of the genre. Or they can be weird, fast-moving, high-concept adventures. I can appreciate and enjoy the former, but it's the latter that thrills me most. DC Comics One Million is one of the best examples of Morrison in his high-concept adventure mode. It's the story of the Justice League of America (Superman, Batman, Wonder Woman, Green Lantern, Flash and Aquaman) swapping places with their far-future counterparts from the 853rd century as part of a celebration of the original Superman's emergence from the sun. Naturally, everything goes wrong and the two teams (and various other superheroes) must work together across the millennia to save the day. The core of this book (DC One Milliion #1-4 and JLA #1000000) was written by Morrison and tells the story in its bare bones form. Some of the extra issues in the Omnibus (in particular, the Martian Manhunter and Resurrection Man issues) flesh out the tale and add more depth to its climax. And other issues in the Omnibus are non-essential, exploring the world of the 853rd century. DC One Million collects f a great DC crossover event. A few reviewers have complained about the mixed quality of the writing in these issues, but I for one find this absurd -- even the best publisher wide crossover is bound to arrive with a huge range of quality (see for example "Blackest Night"). Yes, some writers fall flat when faced with the challenge of this set up and others play it for laughs, but those truly gifted writers and artists are unleashed here to produce extraordinary work. The DC One Million collects f a great DC crossover event. A few reviewers have complained about the mixed quality of the writing in these issues, but I for one find this absurd -- even the best publisher wide crossover is bound to arrive with a huge range of quality (see for example "Blackest Night"). Yes, some writers fall flat when faced with the challenge of this set up and others play it for laughs, but those truly gifted writers and artists are unleashed here to produce extraordinary work. The very concept here is pure Morrison: bold (almost recklessly so), occasionally incoherent, and an overall great ride. As with other DC Omnibus treatments, the actual product is just lovely, with its strong binding, oversized pages, and vibrant color. So why only four stars? Holy mother of sweet baby Buddha!! That was one heck of a read! And by that I'm referring to the sheer size of it. All 1000+ pages. I've been wanting to read this for a while, but wanted to make sure I read it all together so I didn't get lost. I must say I'm of mice emotions. Overall I enjoyed the event. With all the tie in stories it helps build the universe and the building threat. On the downside to this was the fact that when we finally got to the climax it didn't feel complete. I found mysel Holy mother of sweet baby Buddha!! That was one heck of a read! And by that I'm referring to the sheer size of it. All 1000+ pages. How's that for blue balls!! Like I said earlier though, it's still a fun read. The stories leading up to the end were for the most part well done. Some are better quality than others. And some are just downright weird (I'm looking at you Creeper). As well as the difference in writing quality, the same can be said for the art. Although I only found myself hating only a few (cough cough Aquaman cough cough). An amazing story that crosses tens of thousands of years collected in a great package. Morrison knocked it out of the park with this line wide event. It's a neat story. You really need to read all the side stories to fully appreciate it, though. Omnibus en tapa dura que incluye absolutamente todos los #1000000 de 1998 más los especiales relacionados publicados años después. crushed my chest and impaired my breathing while reading in bed. As for my overall thought on this, I think it can be best described as a “cornucopia of ‘hmmm’”. This is yet again another odd, weird, and at times boring mixed bag of stories. You can see Morrison stretching his wings into the realm of weird with the main story arc in the omnibus. The main arc is alright and rather interestin What a read! This is yet again another odd, weird, and at times boring mixed bag of stories. You can see Morrison stretching his wings into the realm of weird with the main story arc in the omnibus. The main arc is alright and rather interesting, but nothing to really write home about. The setup for the premise as to why the JLA is catapulted to the 853rd century is a bit weak as is the length of the main conflict. It felt like they were trying to do a massive (and hopefully memorable) crisis as DC is wont to do. However, I don’t think this one’s going to be hanging around in my brain and be as memorable as some of the other major DC crossovers and crises. Again, can’t fault the main arc too much as the art is nice and you get exactly what you’re being offered. The annoying bits that took this down a couple of pegs for me were the tie-ins and one-shots that were in the original run of DC One Million. Some of these felt downright pointless and distracting. Some of the more annoying ones for me where with the 1M version of the Legion of Superheroes, any of the 1M stories with Robin the Toy Wonder and their version of Superboy/OMAC, and that last Aquaman story where the art was so abstract and confusing, that I felt nauseous. Some of the later tie-ins, such as the more recent Booster Gold (that was only written a few years back) were actually quite welcome and served up some hubris for a generally arrogant character. I get that this is a look into the far future and commentary on the hyperspeed that we currently get an overload of information, but some of the HeadNet tabloid stuff took me out of the story at times. It really felt like I was being accosted with information, but maybe that was Morrison’s aim all along. Am I upset I read this? Nope. Happy I did, but unsure that I’ll be breaking down doors to re-read it anytime soon. Really 4.5 stars, but ranking it 5 is fine with me. I think Grant Morrison has a tendency to be a little long-winded in some of his stories. That is not the case here, as this is a nicely packaged omnibus. The tie-in issues are spaced between the main issues of the 1M mini-series in a great way that really adds to the story and also makes the book really easy to read. Each member of the future Justice League A gets and opportunity to shine, and their interactions with the current JLA are nicely Really 4.5 stars, but ranking it 5 is fine with me. Such fun! Not the wildest idea from Morrison yet you can see his sensibilities. The whole book is an over to top summer blockbuster and it is high on sci-fi! Some tie ins are boring, some are really really interesting and in total they are the snapshot of late 90's Dc Comics with familiar talents and forgotten ones. You may lost with sup-plots but let yourself in and do not try to connect everything. It is a story about time and time will control you! Finally finished!!!!! Such a great book! The thought of so many centuries passing is.... Awe inspiring but also makes me sad to think that in the 854rd century (where a lot of this story takes place) Jeremiah is LONG gone! Some of it was over my head. That is not a feeling I like when reading comics! Overall, though, pretty darn fun.